Usually a bustling crowd pervades the loggia during the hours of noonday. Now the arches are hung with knitted or woven woollen shawls, pale blue, white, vermilion, and striped stockings; and the populace chaffers over prices in the possible purchase of these luxuries. Now the market of straw is held here, golden bundles cut in lengths, and whole sheaves piled up on all sides, with the ruddy country folk standing in groups, their cloaks and coats of many seasons faded to yellowish-green and russet tints, and the women and girls plaiting long strips, their fingers moving with the mechanical rapidity of knitting, as they hover about in the crowd. A few loose straws float in the basin of water at the feet of the Boar, and some children launch a fleet of wild poppies as boats, while their seniors discuss the price of grain. The Flower City of late years, by a happy inspiration, has elected to hold a weekly sale of sweet or rare plants in the loggia. Where could a more beautiful setting be found for a flower-show in any capital? Our Boar is embedded in bloom, and the sunshine strikes sparks of lustrous gold from the bronze head and shoulders. His aspect is full of benevolence. If he is kin to the wild boars hunted in the Maremma by king or courtier, his tusks do not savagely wound assailants. The contadini may recognize in him a cousin to the lean black pigs, acorn-fed, driven down the Casentino from the Apennines, where the shepherds and the mountaineers make the humble utensils out of pine and beech wood, the ladles, bowls, broom-handles, pepper-boxes, and sieves that go forth over all Italy, Germany, and the Orient in emulation of the French industry of the Vosges. In March weather the columns of the loggia are heaped with pink hyacinths, daffodils, and carnations, starring silvery-gray tendrils of leaves. Another morning the branches of white lilies of waxen perfection of cup and hue, imitated in silver-work on church altars, and carried by Carlo Dolci’s angel of the Annunziation in the picture of the Pitti Gallery, load the air with a sickly sweetness of heavy perfume. Again, the anemones, crocus, primrose, and violet hold a luxuriant riot of possession of the historical loggia or the homely lilac makes a bower of soft, snowy bloom. The loiterers who frequent the Mercato on such occasions, lured hither by the flowers, like the honey-seeking bees and wasps, have a certain interest to the speculative and philosophical mind, if man’s noblest study be truly mankind. 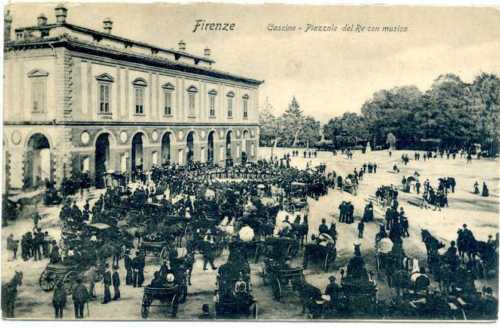 The old airs are difficult to catch, and still more difficult to note; but I have succeeded in making a considerable collection, some from the peasants in the country, some from friends, and others from hackney coachmen, masons, etc., in Florence. The inhabitants of the San Frediano and San Niccolo quarters of the town are reckoned the best singers, and a guitar is to be seen in nearly every house on the southern, or unfashionable side of the Arno. New songs are composed by the people every year, and on fine summer nights one often meets a crowd of one or two hundred people silently following three or four men with guitars, and perhaps a flute. You ask an explanation. ‘E Oreste che canta’ (‘It is Oreste who is singing’) is the answer. Some of them have beautiful voices and sing wonderfully well. I know of a young mason with a tenor voice who was offered £400 – a large sum in Florence – if he would learn to sing for the stage; but he preferred his liberty, and refused. As the singers pass slowly through the streets, you hear the noise of opening windows far ahead, and occasionally a loud bene! or bravo! comes from above, generally acknowledged by the little band stopping a few minutes to finish their song. One of the well-known singers in Florence at the present moment unites the incongruous occupations of a butcher and a flower vendor. In winter he kills oxen and lambs, and in summer he sells flowers. When he sleeps I know not, as he sings nearly all night long in the people’s cafes, or in the streets with his companions. On the Arno! Do not the words recall a familiar scene with the distinctness of an etching. The length of quay curving in the distance to the cloud of foliage of the Cascine, the Piazza Manin midway, with the monument of the Venetian patriot in the centre, the weir and circular abutment of parapet opposite the Hotel de la Paix, and the bronze statue of Garibaldi flanking an orange-colored building beyond, all these features belong to one of the world’s most renowned thoroughfares. Who does not remember, in a much-travelled age, the leisurely holiday crowd of the Lung’ Arno, ebbing and flowing mothers and daughters in their best attire, the babies straggling behind, all prepared to gaze at the passing carriages and their occupants, the ladies in fresh Paris toilettes? A Florentine throng this, worthy of a passing contemplation, renowned for epigram and repartee, keen-eyed, mocking, ready to detect and laugh at any absurdity or weakness, could one but hear and understand the winged sarcasm as it passes from lip to lip. It is, also, a populace not too trustworthy on such occasions as the languidly recurring Carnival, being more prone to hurl missiles than flowers. No doubt there is an Arlotto Pievano, with a ready jest, in a group of priests taking a walk at the sunset hour. No doubt there may be a barber Burchiello abroad with his family to-day, ready to keep alive a little gayety in a careworn and depressed world by his own trolling songs. The old men are abroad to enjoy the day. The aged Florentine citizen of the middle class is a most interesting type, a certain refinement tempering the shrewdness and intelligence of shrivelled features. Behold him on the Arno, serene, amused, and respectable, as retired merchant, goldsmith, optician, shoemaker. He is also a citizen of the world, the old Florentine, and astonished at nothing new, having seen many pageants. On such occasions the beggars, wrapped in cloaks as withered as themselves, have crept out to warm chilled blood in the sun on the benches opposite the Carraia Bridge. The three blind match-vendors, granted a long life of misery, stand in their accustomed places before the Corsini Palace. The peasant women from the Abruzzi, in their picturesque costume, and with gold ear-rings depending beside their brown cheeks, form a spot of warm color near the weir – red, green, and yellow – with their pile of blankets exposed for sale, wherewith to deck draughty doorway of hotel or pension or to drape the bleak walls of an apartment corridor. These wily sirens knit as they watch for the traveller, to extort a higher price for their wares than need be paid for the same article in the carpet-shops. 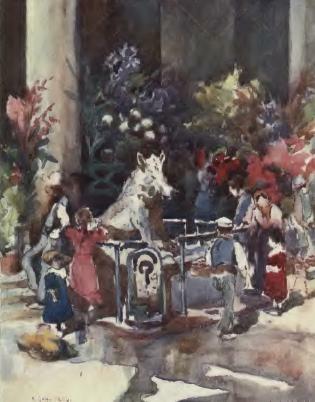 The flower-vendors circulate beneath the balconies of the hotels, with coaxing smiles, equally sure of their prey, the stranger intoxicated with their burden of sweetness and color. Who does not remember the night on the Arno? If masculine, you took a fresh cigar, and strolled forth after the dull table d’hôtel, instead of seeking theatre or opera. The Lung’ Arno was silent and deserted, with the lights of the gas lamps reflected in the river, the stars and the moon shining in the sky. The Arno glided along swiftly, with sparkling crests of foam visible occasionally, a stream devoid of volume or steadiness, descending from the mountain height of the Falterona, traversing the Casentino amid vineyards and olive-trees, and pressing onward freer in course, if you will, because the Libyan Hercules once removed the rock, at Signa, which formed a marsh. In the shadows of evening the river has a quiet and pensive beauty of aspect. Never could the traveller apply to the famous current Dante’s scornful epithets, as, ‘rising meanly among swine more fit for acorns than human food’, reaching the ” ‘snarling curs of Arezzo’, thence flowing to the ‘abode of wolves at Florence’, and finally descending to the ‘foxes full of fraud’ at Pisa. ‘The ill-starred ditch’ has an appearance of innocence and tranquillity beneath the stars. 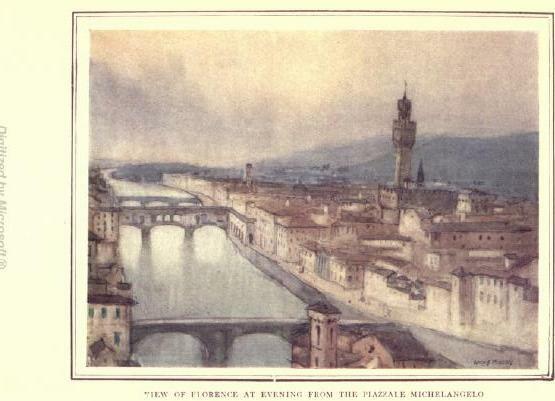 In the shades of midnight memories may stir abroad of Buonconte da Montefeltro swept down by the overflow of the Archiano, after the battle of Campaldino, of the ashes of Savonarola cast to the tide from the Ponte Yecchio, of the key of the Famine Tower dropped into the wave at Pisa by the Archbishop Ruggieri. Possibly a guitar twanged farther up the street, and a singer rendered some Neapolitan ditty in a heavy bass voice. A sullen splash beneath the Ponte Carraia suggested a suicide. The Duomo bell boomed out a few hurried strokes on the still night. Was it a summons for the Misericordia to seek the suicide on the opposite shore? If feminine, you assuredly strayed as far as the Piazza del Duomo to admire, in a sentimental mood, the marble statues and columns, glorified by the moon. This is one of the world’s thoroughfares, with open spaces visible, of sky, mountain, and open country beyond the suspension bridge, such as no other street, flanked by lofty buildings, churches, and squares, can boast. Not less curious and interesting is the throng of sojourners to be met on this quay. A tide of strangers traverses this pavement each season, and vanishes again. Every stage of peevish invalidism, following the advice of Mr. Wortley Montagu; rosy brides, native and foreign; mothers and daughters, chiefly Anglo-Saxon, and with an abstracted expression often, as of grasping at shadows, having missed the substance in some fashion; and whole phalanxes of the ‘glorified spinster’, scurrying out of the doorways of pensions, always under the pressure of utmost speed of locomotion, such are elements of the winter day on the Arno. Eccentric types abound at all seasons, the old gentleman of parchment visage, who walks for his health, with mechanical precision of gait; the old gentleman, bewigged, rouged, attired with juvenile gayety of taste, suggestive of a bygone generation of club-man of Regent Street or Cheltenham; the old lady, whether of the faded furbelow species of the keepsake album, or fantastic and flighty and from the provinces. In addition, the great of the earth like to walk on the Arno, incognito.